Lindsey asks: How fast do electrons flow inside electrical cables? 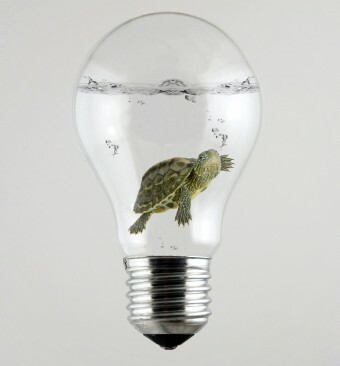 You may be surprised to learn that electrons flow through a typical copper wire much slower than a turtle walks. Each wire that conducts a flow of electrons, producing usable electric current, is composed of billions of atoms. To move along it, the electrons have to traverse these atoms, randomly zig-zagging their way as they do, resulting in the net flow rate, called “drift velocity,” in a given direction being quite slow. I is the current, n is the number of electrons per cubic meter, A is the cross-section of the wire, Q is the charge of an electron and v is the drift velocity of the electrons. Since the number of electrons in a copper wire (n) is 8.5 * 1028 per m3, and the charge of an electron (Q) is 1.6 * 10-19C, if we also know the cross sectional area and the current, we can calculate the electrons’ drift velocity. For example, suppose you have a current of 14 amps and a copper wire with a cross section of 3 * 10-6 m2. Plug in all the numbers and you get that the electrons are moving at a speed of 3.4 * 10-4 m/s – or about one-third of a millimeter per second. To put it in values that are easier to conceptualize, this works out to about 1.2 meters (4.1 feet) per hour- a rate far slower than the average box turtle, which can cover about 800 feet in that same amount of time. So how is it that something that is essentially slower than a turtle can more or less instantaneously turn on a light across a room? The atoms in the wire are crammed together cheek to jowl, which, while it makes the going slow, also has the electrons more or less abutting one another. When the switch is turned on, thanks to the electrical potential difference created by the generator, a force is created to move the electrons, with each pushing its neighbor, which in turn pushes its neighbor and so on all the way through the wire. So, while no electrons zoom through the wire to turn on the light as you might have previously thought, it ends up seeming like that is what’s happening. This is not unlike how when you turn on your faucet, water instantly comes out despite the fact that your water source might be many miles away. The land speed record for a tortoise in competition was set by a leopard tortoise named Bertie who flew up an 18-foot uphill track in just under 20 seconds (about 0.61 mph) in 2014. You can do similar calcs and receive similar results for a photon traveling from inside the sun until it escapes into space. If you’re implying they travel one way, that would be direct current.. When we flip on the light in a room, the electricity supplied to the light bulb is alternating current. The electrons just shake back and forth, so no forward progress. I like the thought though, nice article. Another way to visualize, as it was suggested to me, is to think of it like having a long length of solid rod placed against your chest while someone else smacks the opposite end. You’ll feel the results instantaneously regardless the distance between the smacker and the smackee. A turtle would usually swim… do you mean a tortoise?